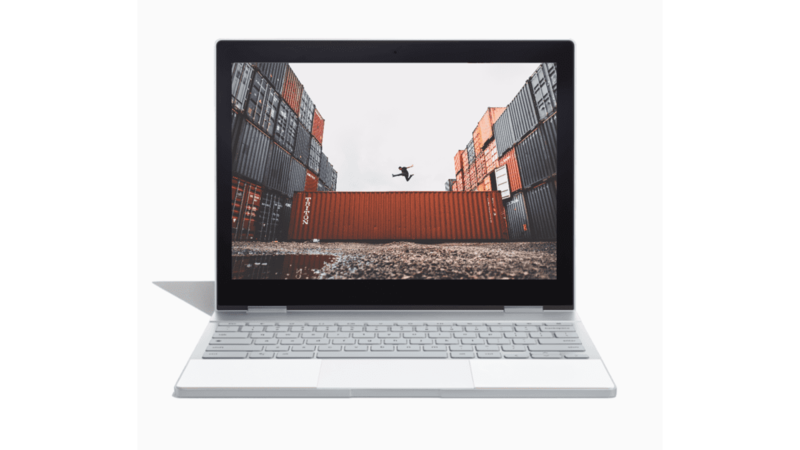 Last month, I penned my thoughts on what the future of Chrome OS could look like and how devices like the Pixelbook could play a big part in the implementation of containers on Chromebooks. Running non-native apps on top of the Chrome operating system without the need for hacky workarounds would be a monumental watershed for Google who has now tossed a hat in the ring to capture their share of the consumer PC market. Virtual Machines, like VMWare, aren’t new and as a third-party solution work very well. However, the development we have been tracking goes well beyond a traditional, web-based solution. The work being done here seems to remove the third-parties and eliminate a browser by creating a built-in container system that can run, in theory, any app the hardware will support. Now, I know I have simplified the process to an elementary understanding but well, I’m a simple guy. The fact remains that developers are working on (or have already created) a method with which to run non-native applications and OSes in containers on top of Chrome OS. Android apps are proof of that and the continued development of the crosvm (kvm variation) is proof there is a bigger target in mind. Admittedly, when we first pondered the notion of being able to run down to the local Best Buy and purchase a Chromebook that would be able to access multiple platforms, run countless applications or manage a server, the wheels began turning so fast they almost fell off. The possibilities would be endless. Not to mention the fact that, for most users, the need for a Windows, Linux or MacOS device would be all but negated. October 4th has come and gone. The Pixelbook will soon start shipping to consumers and we will see how the new generation of Chrome OS devices are received by the general public. To my mild disappointment, the was no mention of containers or virtual machines at Google’s hardware event. I had to take a step back an remind myself that, aside from the launch of the Samsung Pro/Plus at CES, this was sort of coming out party for the Pixelbook and Chromebooks in general. Google’s previous Pixel devices were aimed at developers and manufacturers to set the bar for Chrome OS’ capabilities. Not only that, Google’s Oct. 4th event was a primetime stage set to launch primetime products. Whatever it is the Chromium devs are working on, obviously isn’t ready for that kind of attention, yet. I came back from California more determined than ever to find some concrete evidence to support my theory that something much bigger was in the works. This week, I may have found just that and while it leads me away from the consumer market, the implications are none-the-less staggering. I’ll just pause and put this here. This is a screenshot of the commands available in what is known as crosh shell. 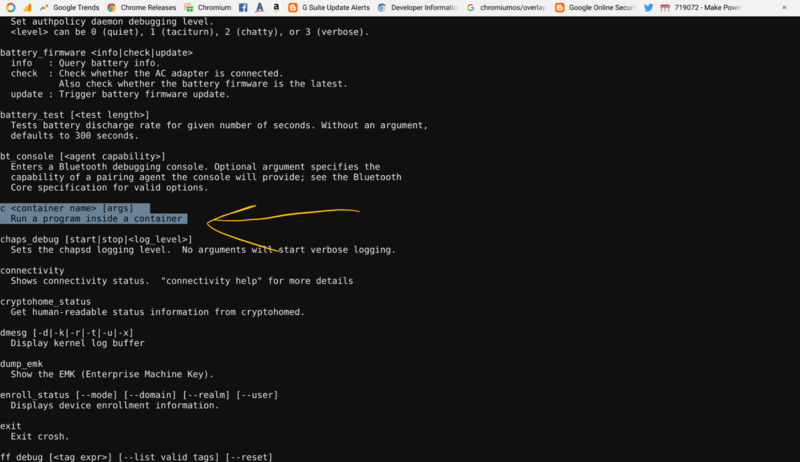 This UI allows you to invoke Linux commands in Chrome OS directly in your browser. It is similar to the terminal found in desktop versions of Linux. If your machine is stock Stable Chrome OS, this list of commands will give you access to a few things unavailable in the general Chrome OS settings. Currently, to do more in-depth things like dual-booting Ubuntu requires you to also put your device in developer mode. This is, for all intents and purposes, running a container version of Linux. Instead of two operating systems side-by-side, Ubuntu is essentially running on top of Chrome OS. All of this takes a tad bit of tinkering and isn’t “officially” condoned by Google or the manufacturers of Chromebooks. If you follow this path you will be clearly warned you’re on your own. Now, back to the image above. That is the crosh shell of a device in the Stable Channel and NOT in developer mode. You can see highlighted in blue the command to run a program inside a container. Here’s a closer look. So, how does it work? At this point, your guess is as good as mine but it is clear that soon you will be able to call a program inside a container directly from the crosh shell, at least for some devices. Like it or not, the masses are accustomed to user-friendly interfaces, one-click solutions and software that requires minimal input on their part. Opening a crosh shell and inputting commands into a screen that looks like something from a 1977 TRS-80 isn’t going to sell Chromebooks at WalMart. This brings me back full-circle to my previous theory that Google is gunning hard for the world of Enterprise. There are murmurs from inside Google that the search giant is looking to make a shift to become more dependent on their own hardware/software and move away from the heavy dependency they have on Linux and other platforms. Creating a “universal” platform on top of Chrome OS would give Google a very compelling case to exponentially expand the corporate reach of their operating system and in turn, their hardware. Chromebooks have become a mainstay in schools and it is much to Google’s benefit but a Chrome OS corporate takeover could be a game-changer for the company that thrives on data, machine learning and now A.I. In my humble opinion, this a Google playing a game of Chess. Stabilizing their own infrastructure atop Chrome OS will give them a foothold in the Enterprise sector. Then, if the market is there, developers could very well create a more Material Design method of calling non-native apps for consumers. It’s more than plausible, it’s possible and already happening in the form of Android on Chrome OS. The question will then become, is it necessary for the consumer market or will Chrome OS find a place in the hearts of retail shoppers? You may be wondering when this “containerization” project will become reality. My best guess would mid-December. Much of the work being done on and around containers, virtual machines and their many pieces have many references to M63. Version 63 of Chrome OS is slated to launch December 12th. With any luck, we will see apps in containers in action by the end of the year. Don’t expect much fanfare, however. This is very much a developer-focused project at the moment and likely will garner little interest from the mainstream PC world. Regardless, this is exciting stuff. Chrome OS as we know it could soon change forever and that, my friends, is awesome.